MediShare Reviews - Our Complete 2019 Medi-Share Review: Who Should Join? Medi-Share is a Christian healthcare sharing program where members pool their financial resources and share the medical expenses of other members. I am writing this up-to-date 2019 review based on my years of experience as a member of Medi-Share. When you join Medi-Share, you select your desired Annual Household Portion (AHP) which works just like a deductible does for traditional insurance. You then make monthly payments that typically cost around 60% less than your premiums would be with normal health insurance (more on cost below). So long as you've paid more than your AHP in the past year, Medi-Share simply pays the bill for you using the monthly shares of other members. If you haven't yet reached your AHP, then they negotiate the best discount they can and you're mailed a bill for the rest. For example, if your AHP is $1,000 and you have spent more than this amount on medical bills in the past year, then subsequent visits will cost only the $35 copay. Who is allowed to join Medi-Share? Membership is open to Christians who are devoted to living a Christian lifestyle. You will not be quizzed on the bible or asked to prove you attend church. Medi-Share works largely because it is a community of like-minded members with strong Christian values. See our cost comparison page for a full answer to this question on Medi-Share pricing. The short version is that your monthly payment will depend on your marital status, age, and desired Annual Household Portion (deductible). For example, if you are 40 years old and have a family with children, you'll have options ranging from $237 to $753 per month. The healthy share will be the rate you qualify for so long as you have reasonably healthy weight and blood pressure. ​How much will I save with Medi-share? In the chart above, we see that a healthy 40-year-old with a family of 4 will pay ﻿$325 per month for an $8000 Annual Household Portion (deductible). A similar plan averages around $1140 per month across states on Healthcare.gov. Of course, it's important to make an apples to apples comparison. Traditional health insurance may have benefits including lower copays and the ability to deduct monthly premiums. Including all factors, we believe the average family saves 60-65% per year with Medi-Share. This will usually come out to being somewhere between $2,500 and $10,000 per year in savings. For our family, my calculation is that we save around $4,800 per year -- a 63% discount relative to our past health insurance. How is Medi-Share able to charge so much less? With conventional insurance, a significant part of what you are paying is the insurance company's profit. There's a reason that Warren Buffett became one of the wealthiest people alive largely through the insurance business. Insurance companies also hire teams of actuaries and investment experts in addition to facing substantial regulatory costs which are passed on to their customers. By contrast, Medi-Share is a non-profit organization devoted to helping Christians. Are there any complaints about Medi-Share? While we have had only positive experiences with Medi-Share, our goal is to write a fair and balanced review. So far though we have not encountered complaints from searching online and talking with other members. 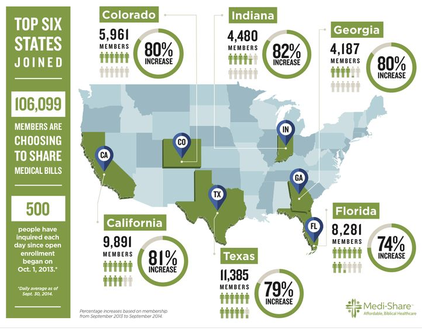 Medi-Share remains in good standing in all fifty states. With that said, here are two important things to be aware of. First, medical expenses going against a Christian way of life aren't covered. These include drug abuse recovery, getting in a car accident with alcohol in your blood, or getting an abortion. Second, your monthly payments are not tax deductible, like they usually will be with conventional health insurance premiums. If you have had any problems with Medi-Share, please email me and I will be happy to add them to this section. Am I allowed to see my normal doctor or medical provider? Yes, but you pay less if you use a doctor or specialist who is part of Medi-Share's vast PHCS network of medical providers. When you become a member, you'll have access to the online Member's Section where you can search for in-network doctors near you, including those with any specialty such as pediatricians or cardiac surgeons. Also, along with dental and vision discounts, Medi-Share now offers free 24/7 online doctor appointments to all members. See our blog for more details. Is Medi-Share Christian Health Insurance? Interestingly, the term Christian health insurance doesn't actually mean health insurance for Christians. Insurance is a heavily regulated for-profit trillion dollar industry. When you buy insurance, the insurance companies see you a way to generate cash flow by taking in your premiums and investing them. They are incentivized to take in as much as possible, and pay out as little as possible. Christian healthcare sharing is a non-profit alternative where members share each other's medical bills. As Christian personal finance expert Dave Ramsey discusses, Medi-Share has a decades-long track record of reliably getting medical bills paid for its members. ​﻿﻿When my wife and I discovered Medi-Share, we joined primarily because it made financial sense to do so. Instead of paying the large and growing Obamacare penalty, or paying the significantly more expensive premiums we were seeing on Esurance, we could get a discount of over 60% while supporting a network of fellow Christians. As we continued being members, we found more and more we appreciated about Medi-Share. Its customer service has been exceptional from the start. When you call the number on the card, you're quickly connected to a customer service agent who speaks fluent English. The staff is easy to reach, empowered to help you, and always happy to answer questions and take prayer requests. The actual healthcare sharing process is extremely simple. You show your membership card at the doctor's office, and they send your bill directly to Medi-Share. You just pay the provider fee (copay). If you're over your AHP (deductible), they pay the bill. If you're under, then you pay the discounted rate they negotiate for you. The system has been fully reliable for us, and a tremendous blessing for our family and the 400,000 others who have been relying on it each month for affordable healthcare since they opened their doors as a non-profit in 1993. ​​﻿﻿﻿﻿﻿﻿﻿Now that you have read this review and understand how Medi-Share works, a good next step is to fill out the short form on Medi-Share's site. They will let you know if you're eligible to join and what your monthly payment amount would be.